Maybe it has something to do with that I've been near-sighted since I was 11. Or maybe it's that when I was young I was always considered a "big girl"-- too tall, too broad-shouldered, too angular -- and so of course I was always wanting to be petite and delicate. 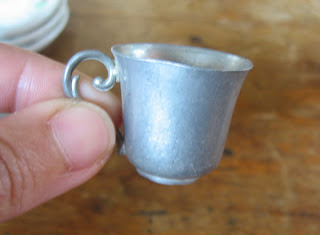 Whatever the reason, I am unfailingly attracted to tiny things; and at those flea markets and vintage-goods fairs I often talk about, I never fail to fall in love with all things mini. 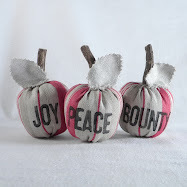 Of course, if you've seen my Etsy shop, you'd know that this obsession continues even while I'm in my work room. 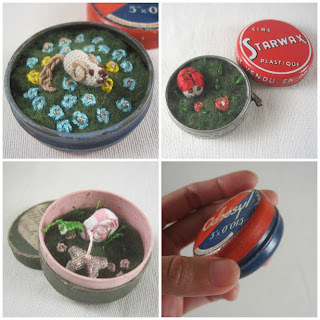 So look what I've done to two old tin cans and a vintage pill box I have in my stash! 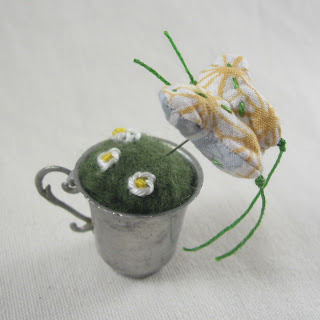 Should we have a little tea party? 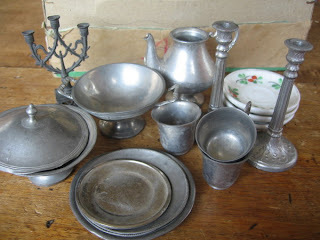 vide grenier = flea market, or car boot sale; lots of fun! And this may be late, but I would really like to thank Marichelle of Heart Handmade for writing such a sweet feature on my White Swans, and La Rimule for my first write-up ever in a Francophone blog. You girls absolutely made my day when those articles came out! 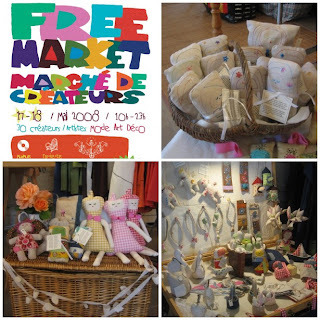 So for the first time ever, last weekend I showed my fabric creations live, at the Free Market in Montpellier. The first day, Saturday, although the market was going to start at 10 a.m., I woke up at five (!!!) because I still had to translate some of my product descriptions from English to French--and, believe me, this is not the most fun thing to do first thing in the morning. By 11 p.m. that night, when the market closed for the day, I was about ready to lose consciousness, but decided to hold on instead and reward myself with a plate of steak tartare and some girl-chatting with Ana and Manu. Fortunately, the next day was a little less traumatic, as there was no more translating to do, and the market finished much earlier, at eight p.m.
* A little girl who saw my yellow apple-head doll and refused to budge from the spot unless the doll was going along with her. * Another little girl who took 30 minutes to decide if she was going to take the miniature basket of cats, or the one with the bunnies, but did it so charmingly and sweetly that I didn't mind her being there at all. * Meeting other crafts artists, and actually already setting up an afternoon exchange of know-how with one of them. * Meeting the couple behind pOOmplastick. Etsy is almost unknown over here in France, so to meet other people who keep a shop over there was cool. And, of course, I had to buy something from them. 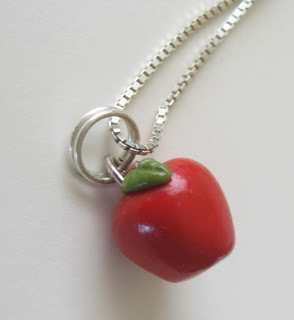 A mini apple--what else? "I find Elisa in my parents’ bedroom, embraced in our mother’s arms. With their faces relaxed like that, they look so much alike. Same high cheekbones and prominent foreheads, almost identical full lips, their hair long and straight, all over the pillows. On my way back to bed, I pause in front of the mirror hanging in the hallway to the bathroom. It is a simple square on a wooden frame. I don’t really like what I see in there: me, my father’s child, short and round, with hair so curly it is unmanageable if it isn’t cut very short like a boy’s. I keep looking only because there is something else. There are reflections of our bedrooms, the Rose and the Lavender, my sister’s and mine. Maybe, if I just look long enough, manage to catch the right angle, I can also finally get a glimpse of my mother and sister’s secret world." So goes part of my short story "Psychic Family," published in the magazine The Digest of Philippine Genre Stories. For several weeks now, it's been for sale in certain Philippine bookstores, like the Comic Quests in SM Megamall and SM City. 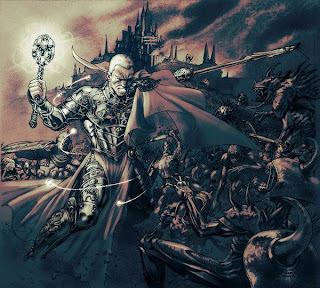 For updates, go to publisher Kenneth Yu's blog here. If you love me, you'll get yourself a copy!